MONDAY: Choice of: Chicken n’ Waffle or cereal or Poptart with yogurt; fruit, choice of milk or juice. TUESDAY: Choice of: Breakfast sliders or cereal or Poptart with yogurt; fruit, choice of milk or juice. MONDAY: Mini cinnamon roll, applesauce cup, juice, milk. 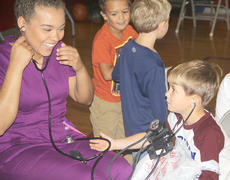 Career Day on Friday, Nov. 4. Skylar Hatfield, 5th; Camille Hatfield, 3rd; Mae Heimlich, 1st; Colton Jones, 1st. Abigail Rion 5th; Isaac Furnish, 4th; Jackson Ware, 4th; Isaac Finch, 3rd; Madison Jones, 3rd; Resa Heimlich, 3rd; Kathryn Gasser, 3rd; Sarra Skinner, 3rd; Addison Perraut, 3rd; Sutton Koch, 2nd; Miles Navarre, 2nd; Perrin Jack, 2nd; Farrar Naomi, 1st. At the start of the 2015-16 school year, Harrison County High School ROTC instruction Maj. Jon Montgomery began work on a marksmanship team. After talking with cadets from the program, he decided there was a demand for such a program and went about figuring out how to get it off the ground. 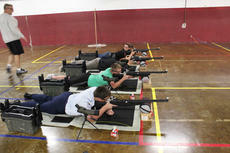 The first step was becoming certified as a range officer through the Civilian Marksmanship Program (CMP). The next step was making sure the team had funding. Enter the National Rifle Association (NRA). The Harrison County School District has partnered with Toyota Motor Manufacturing again, this time with an ‘outside-the-box’ leadership training for school personnel in the newly-formed Harrison County Leadership Academy. “We are so excited about what we’ve accomplished so far with this partnership and with what the future holds,” said Harrison County Superintendent of Schools, Andy Dotson. MONDAY: Choice of: Nutrigran bar with yogurt or cereal or Poptart with yogurt; fruit, choice of milk or juice. WEDNESDAY: Choice of: Pancake sausage or cereal or Poptart with yogurt; fruit, choice of milk or juice. Hospice of the Bluegrass – Cynthiana office will offer a volunteer training on Friday, Nov. 11 at the Hospice of the Bluegrass Office, 1317 US Hwy. 62 E. Training will begin at 12 p.m. and lunch will be provided. For more information call Kelly Kendall at the Hospice of the Bluegrass – Cynthiana Office at 859-234-6462, 800-756-6005 or kkendall@hospicebg.org. We look forward to seeing you.